HP has released its latest Service Pack for Proliant (SPP), the integrated firmware and software bundle which it will support for the next year . I had spotted it in the wild at HP Discover, it was dated 23 June so HP must have given it another week before releasing it into the wild and even then the documentation isn’t available yet. In terms of hardware support, the new FlexFabric 20Gb adapters and switches are now supported. These give you 2 x 20 rather than 2 x 10Gb downlinks to each blade. The SPP is intended for use with the new HP OneView 1.10 which hasn’t actually been released yet. This will be the last SPP to support G5 and earlier servers so HP is further reducing the effectiveness of your older kit after starting to charge for firmware. This is also the last SPP to support Red Hat Enterprise Linux 5. The full ISO download is available today but they haven’t released Windows/Linux/Blade/Non-Blade versions yet. I still hope they do away with the distinction between blades and non-blades. Just have a full Windows and full Linus options please, people don’t generally distinguish between blades and non-blades when manage server firmware. As for documentation, this doesn’t seem to be updated yet, it seems the download has been made public a little too early. Probably best to wait to see what he niggling issues are and what the new Virtual Connect and HP SUM software contains unless you are extraordinarily keen. Today was the final day of HP Discover. There was meant to be a blogger Coffee Talk this morning from HP Software but I was the only one to attend. The HP Software division isn’t in my normal area of interest so was an opportunity to find out what its all about. Instead of having a group blogger chat, I spent an interesting hour with Paul Muller, VP of Strategic Marketing & Chief Evangelist who is a passionate, blunt, straight talking Aussie (the best kind!). If like me you are not aware of HPs software portfolio, it encompasses tools for Business Service Management, Network Management and Automation, Application Lifecycle Management, Quality and Performance Validation, Security, Automation and Cloud Management, Information Optimization, Big Data Analytics, IT Service Management and Mobile Application Development. That’s quite a broad portfolio. Products within these group I had heard of were LoadRunner, Fortify, TippingPoint, Arcsight, Cloud Service Automation, Autonomy but there are so many more. Paul explained how some integrate such as security with Big Data analysis so you can search all information leaving your company network and find out whether any sensitive information is escaping, not just looking for a “confidential” tag on a doc but deep inspection along with machine learning that can correlate patterns across multiple information sources. Day 2 of HPs conference juggernaut continued today. First up I attended another Coffee Talk on Converged Infrastructure in relation to SDDC. 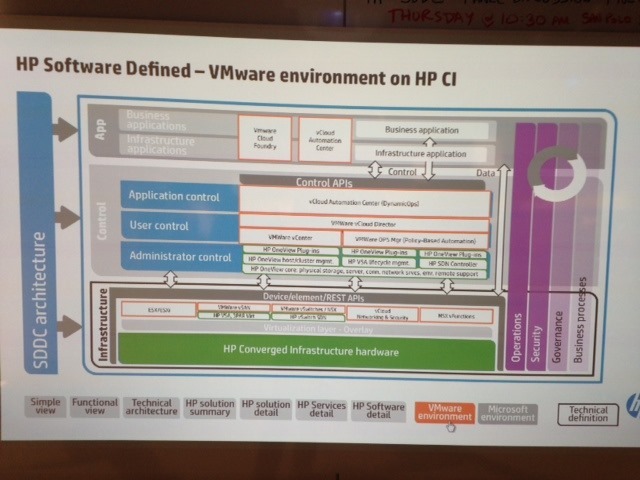 lots of talk about what SDDC is, not much from HP on what that means in terms of software products but I think I worked it out later. People may have a definition of SDDC as requiring commodity hardware but could you have SDDC if it requires specific hardware from a vendor? conceptually I don’t have a problem with than, its ll about definitions. Discussion turned to 3PAR and different control planes, admin, user, self-service and application, all seen as SDDC. Point also made that software anything still needs hardware to run on. There is no SDDC without hardware. Hardware may be being driven to commodity and utility but its still important. My worry is HP is still putting a huge amount of investment in hardware but will anyone be willing to pay enough for it? 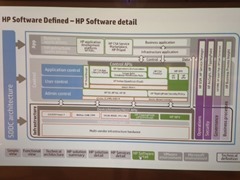 Also talk about management product conversion for SDDC, what HP is doing with OneView. Something HP do have in their favour as on the infrastructure side as a hardware company is they can integrate with anyone, VMware, Microsoft, OpenStack etc. Anyone can bring their software stack to HPs hardware, makes them have a broader appeal than VCE for instance or other converged infrastructures that only do VMware. HP very much wants to be vendor agnostic but sees its future in open source but very much at enterprise level. 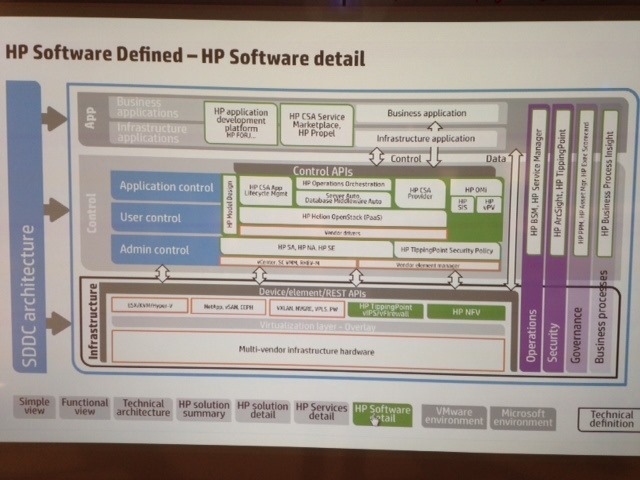 I see HP trying to bring the messy uncontrolled way of open source into their risk adverse enterprise customers. Save costs with open source, don’t be tied to a software vendor but let HP handle the provisioning of your infrastructure on whatever platform or cloud you want is the sales pitch I think. HP can be your enterprise best friend. 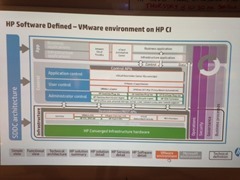 I spotted some SDDC slides later in the day showing how HP software relating to VMware fitted into the HP SDDC world. Spot the three different Vmware,Vmware,VMWare spellings! This week I’ve been lucky to be invited by HP to their annual HP Discover conference in Las Vegas. As I’ve been working with HP technology and it’s predecessors for so long, I really couldn’t miss an opportunity to dive deeper into the world of HP and be able to find out more about the myriad of technologies HP is involved in. Yesterday I travelled for 15 hours from London to Las Vegas via San Francisco and after all that travel headed out to the London Eye in Vegas, well, rather the High Roller, the worlds largest Ferris wheel and met up with the other invited bloggers and social media for spectacular views of the strip. 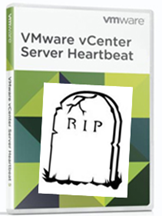 What VMware’s EOL of vCenter Server Heartbeat means for availability? VMware has very surprisingly and suddenly stopped selling vCenter Server Heartbeat from 2nd June 2014. If you have already purchased vCenter Server Heartbeat you will still get support until 2018 so no panic that the whole carpet has been pulled from under your feet but it does beg the question, what to do going forward to make your vCenter installation more highlight available if you need it? In the EOL announcement, VMware suggests first of all making your vCenter a VM to be able to take advantage of HA to provide high availability. If you cannot for some reason (and you really need to ask yourself why) run vCenter as a VM and it is/needs to be physical then the only solution is to use a backup solution to be able to restore vCenter if it fails. HP Discover here I come! I’m very excited that HP has invited me to attend HP Discover in Las Vegas next week as a blogger. It’s going to be an intense few days, 15 hours of travel each way for 2.5 days of HP Discover! I’m particularly looking forward to speaking to HP product managers and executives and chatting to other bloggers and attendees to get a sense of what’s new with the “new” HP. Product wise, I’m first of all keen to delve deeper into HP OneView, HP’s converged infrastructure manager which aims to finally bring together HP’s disparate management tools, ultimately replacing HP SIM which I really don’t like and incorporating Virtual Connect Enterprise Manager. HP OneView runs as a virtual appliance and you pull in your servers, iLOs, chassis, Virtual Connects etc. where they can be managed and reported on from one place. It has an API so you can finally script against it with PowerCLI and other tools which cannot come soon enough.